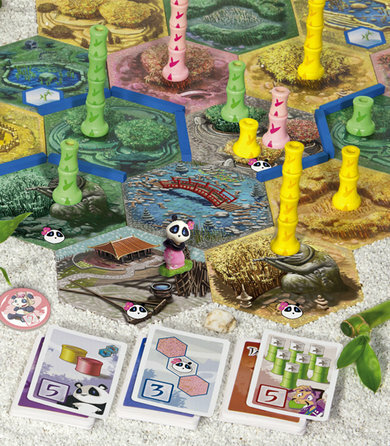 Takenoko Chibis adds that one thing that can make a great cute game about a panda even better – More pandas. Not only a female companion, but also cute little panda babies. What is Takenoko Chibis like? Takenoko Chibis adds quite a few things to the base game. Chief among them is of course the female panda (represented by a nice painted miniature) and the panda babies (represented by cardboard tokens). The female panda (known as Miss Panda) will appear in the game when one of the new bamboo plots show up. Then she is free to move around the same way as the normal panda. The real magic of course happens when she enters the same plot as the male panda, and you most likely already guessed what you get out of that… little cute baby pandas. Each are worth some points and will give you a one time use ability. There is a catch though. You have to give up a piece of bamboo of the colour of the baby panda (there are 3 of each colour one for each special ability they offer). The 6 new bamboo plots also add a little extra to the game. There is a “sacred hill” for each of the three bamboo colours, that will not only make bamboo grow on adjacent plots but on all plots of that colour. Also new to the game is the “celestial pond” that works the same way as the starting plot. In addition to the new pandas and the bamboo plots you also get a couple of extra objective cards that adds a little more variety to the game. 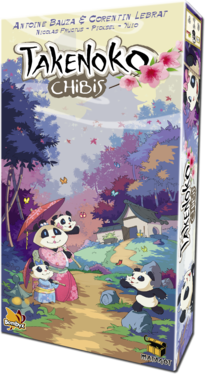 Takenoko Chibis is a good expansion for sure, adding more cuteness to the game and a little extra depth, while at the same time not making the game more complex to play. It’s not essential to the game, but if you already own Takenoko and like it you should definitely pick up the expansion. I could have wished for a little more in the expansion, a few more extra elements of the like. But when you look at what the base game is like and who enjoys it, I can see it makes sense to do a little expansion like this.